Kelp forests and seagrass meadows soak up carbon dioxide and help protect our coasts against rising seas. Just two reasons why we should learn to love our marine forests. By: Dorte Krause-Jensen, Arctic Research Centre, Department of Bioscience, Aarhus University, Denmark. , Carlos Duarte, King Abdullah University of Science and Technology (KAUST), Red Sea Research Center (RSRC), Saudi Arabia, and the Arctic Research Centre, Aarhus University, Denmark., Helene Frigstad, Norwegian Institute for Water Research (NIVA), Norway. Marine forests are really something rather special, and we don’t just say that because we all study them. They consist of kelps that grow on rocky shores and seagrass meadows, saltmarsh, and mangroves on stretches of sandy seafloor. They are widespread in shallow waters across the globe where they are home to a wide variety of creatures including cod and many other fish. But what also makes them so special is their two-pronged approach to help combat climate change. Research has shown that not only do they capture carbon dioxide (CO2) from the atmosphere and lock it away as "Blue Carbon" in the ocean, they can also help us to adapt to some of the impacts of climate change, including sea level rise, coastal flooding and ocean acidification. Here’s why we should all learn to love our marine forests. Lets first consider how these marine forests soak up carbon dioxide. Over the past decade, scientists have become increasingly aware that marine forests play a role in global carbon sequestration, that is the ability to extract CO2 from the atmosphere and lock it away at the ocean floor as "Blue Carbon". 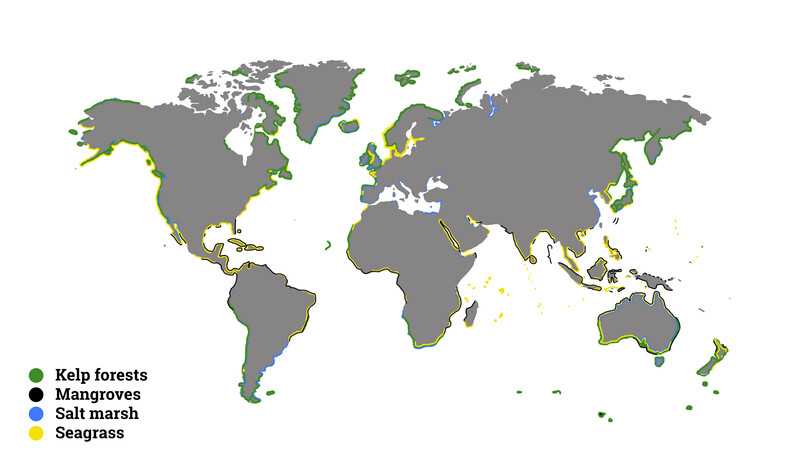 Most research has focussed on seagrasses (check out the gallery above to see a photo of a seagrass meadow), saltmarsh, and mangroves, which grow on soft seafloor in shallow coastal habitats around the globe (see map below). These plants trap their own leaf fall and dead roots, which gradually accumulate on the seafloor beneath. They also trap and store carbon-containing particles from the water. This is what we refer to as a “carbon sink." In fact the carbon sinks that form beneath these marine forests store just as much carbon as forests on land and accumulate at a much faster rate. Kelp is another, often overlooked, type of marine forest. By contrast, forests of kelps and other large algae (macroalgae) grow on rocks and stones. Here, material does not accumulate directly on the seabed beneath them and so it was generally assumed that macroalgae did not support any carbon sinks. This is despite the fact that they form the most widespread and productive marine forests in the global coastal ocean, estimated to cover about 3.4 million square kilometres (see the map below). However, research shows that ocean currents transport much of the "leaf fall" of macroalgae away from the forests, and our research published in Nature Geoscience shows that part of this is then locked away in carbon sinks elsewhere, often in the deep ocean. You can see an animation of this process in the interactive graphic above. We now know that these previously overlooked carbon sinks could be vast. We recently calculated that export of carbon from macroalgal forests may lock away around 173 Teragrams of carbon each year. That’s the same amount of carbon locked away by seagrasses, saltmarsh, and mangroves combined! This is not yet a precise estimate, as we don’t know the full distribution of kelp and macroalgal forests around the world, and we still need to better quantify the amount of carbon that they take up, release, and ultimately store away. But what is clear, is that macroalgae are indeed important, if thus far neglected, players in a Blue Carbon context. Larger marine forests store more carbon. And so the extensive coastlines of the Nordic countries, which are dominated by eelgrass meadows in soft-sediment areas and kelp forests along rocky shores, form important carbon sinks. But still we do not know their magnitude. Danish coastal waters are a particular hot spot of eelgrass, which thrive in the large shallow and gently sloping soft sediments. Eelgrass extends along most of Denmark’s 7,300 kilometre long coastline and is estimated to cover up to 1,345 square kilometres. In fact, the only area where it doesn’t grow is the exposed North Sea coast. Eelgrass also occurs along the Baltic Sea coastline all the way to the Finnish archipelago. Small populations occur in sheltered sandy areas along the coast of Norway, Iceland, and southern Greenland. The Nordic countries are also home to a large fraction of the world’s kelp forests. The rocky coastlines of Norway, Greenland, Iceland, and the Faroe Islands, represents roughly 20 per cent of the global coastlines, which all represent potential areas for kelp to thrive. However, the actual area covered by kelp in these regions remains to be discovered. Finland and the east coast of Sweden have no kelp forests due to the low salinity of the Baltic Sea, but other macroalgal species, such as rockweed, thrive under those conditions. Nordic saltmarsh areas are also yet to be quantified. Providing natural coastal protection against storms. Elevating the seafloor to protect against sea level rise. Creating high pH oases in an acidified ocean. Both seagrass meadows and kelp forests deliver coastal protection by attenuating waves along the coast. Seagrasses provide further protection by trapping particles and building up sediment at the seafloor, which are then stabilised by their underground structures of roots and rhizomes. The formation of such Blue Carbon sediments gradually elevates the seafloor, thereby counteracting sea level rise. Seagrasses, as well as forests of kelps and other macroalgae, also have the capacity to create oases of high pH during the productive summer period, offering protection to organisms with carbonate shells, including mussels, snails and shrimps, from increasingly acidic oceans. Read More: Will climate change affect Norwegian kelp forests in a positive way? Ocean acidification is a well-known side effect of climate change, whereby the oceans become more acidic (lower pH) as they soak up CO2 from the atmosphere. Our research shows that intense photosynthesis of marine forests extracts CO2 from the water and thereby form refuges from the general increase in CO2 that leads to ocean acidification. During the night, the opposite happens as the forests respire CO2 and thereby reduce pH. However, some calcifying organisms are able to benefit from the fluctuations in pH created by marine forests by producing their carbonate shells during the daytime. In our research, we observed these high-pH oases in Nordic marine forests in the Disko Bay, Greenland, where the long summer days make this effect prevalent during spring and summer, which is the most critical period for calcifying organisms in terms of growth and reproduction. All of this goes to show that there are many reasons to protect and expand marine forests. And it is clear that they represent a vast, though as yet, poorly quantified resource in the Nordic countries, with significant hot spots of eelgrass in Denmark and extensive kelp forests along rocky shorelines that extend into the Arctic. These forests most likely store large amounts of carbon, but the question is, how much? And how can they help us combat climate change in practice? We’ll explore this in our next article.